Perhaps the most confusing part of lighting selection in recent years has to do with the emergence of the LED, short for light-emitting diode – a phrase that rolls off the tongue, right? When it comes to event lighting, LED fixtures have been revolutionary. Typically available in red, green, blue, amber and white, LEDs can be mixed to create broad strokes of vibrant color. You can program them to slowly change color throughout your event, perhaps glowing red when guests first arrive to a rich purple at dinner to a sumptuous blue that matches the evening sky. Even better, LEDs generate less heat and require a lot less electrical power, making wiring the fixtures much easier and power costs cheaper. In fact, LEDs can be battery powered and eliminate wiring and onsite power requirements completely. 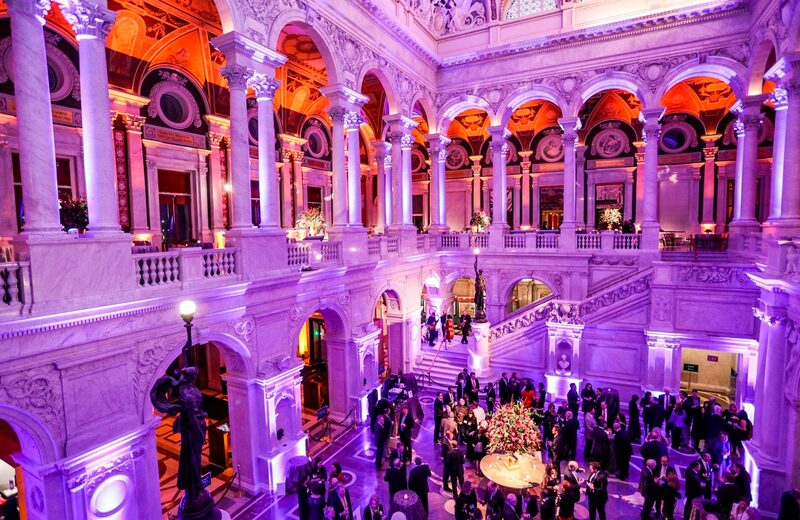 LED fixtures set up wirelessly are another practical option for your lighting designer, especially in historic Washington DC settings like the Library of Congress, Mellon Auditorium or the White House where short installation times and the banishing of tape are typical constraints. Wireless LEDs make these requirements nonissues. LEDs in event production are constantly evolving. There are intelligent lighting fixtures, magnetic battery spotlights and more creative use of this technology unveiled every year. 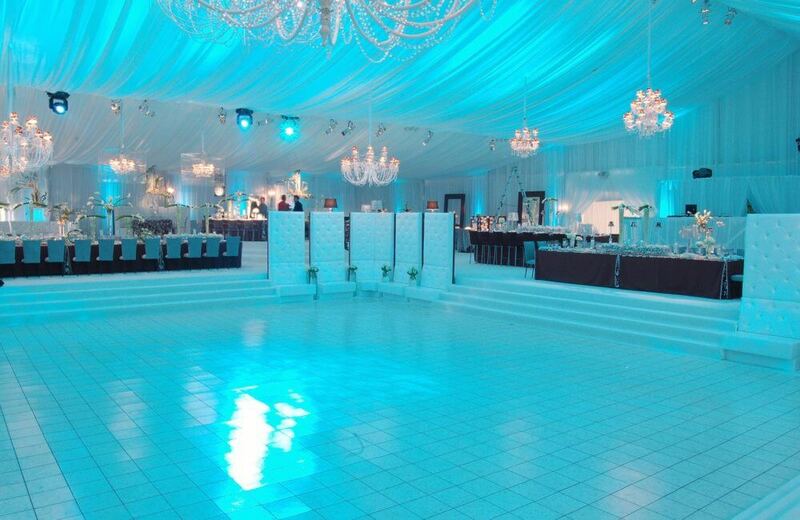 But while LEDs may be revolutionizing the event industry, they are not always the right fixture for the job. A few years ago, we produced a wedding at the Mellon Auditorium using LEDs. The entire team was so proud of what we were able to do by cutting down all the heavy wiring and eliminating ugly cable ramps between columns. Other vendors such as the catering and floral teams were complimenting us on a job well done. But our high-fiving was short lived. The client came in next and absolutely HATED it. She said we had destroyed her vision with horrible lighting. By definition, incandescent lighting fixtures use lamps or bulbs “with a wire filament heated to such a high temperature that it glows with visible light.” These are the standard lighting fixtures used for years. The glow an incandescent light creates has a soft warmth that LEDs are not yet able to reproduce. To add color to incandescent bulbs, designers can apply a lighting gel (a transparent colored material), resulting in softer hues than an LED can achieve. Clearly our client was all about the soft warmth and color. And in the end, we realized we were off the mark. Both LEDs and incandescent lighting fixtures have their uses. We tend to design with incandescent lights for weddings and events for which a warm and flattering ambience is essential. Sometimes, a bride will contact us and ask for LEDs with a warm amber. (That usually tells us that she has been talking to a DJ. DJs love to use high-energy, moving LEDs to fuel dance frenzy.) What we tell all brides is to consider the wedding in its entirety – not just the dancing – when designing lighting. You’ll want some parts of your wedding – like the entrance, the dinner – to be more reverent and romantic. You’ll want to highlight romance, a bit of drama, a certain glow. Lighting should evolve with the evening and the entire party vibe, not just the dancing. Uplighting with incandescent fixtures and a candlelight gold gel is a wonderful approach to consider for the softer moments. 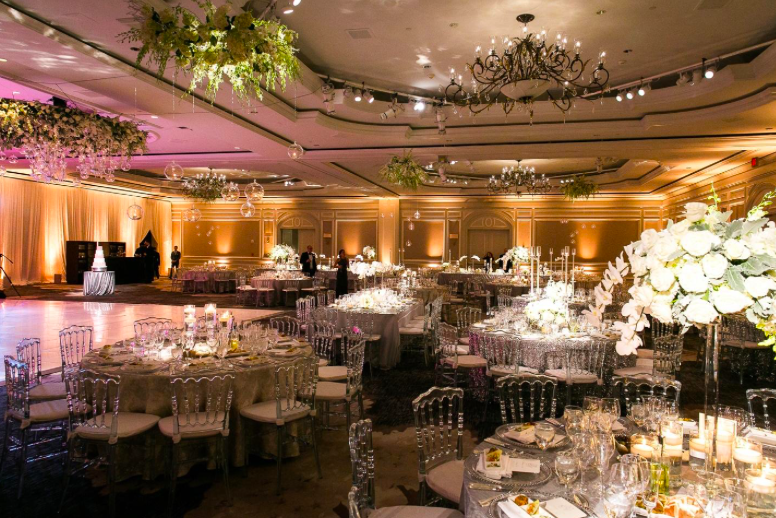 Kudos to Evoke for event design at the Ritz Carlton DC and to Roey Yohai Photography. 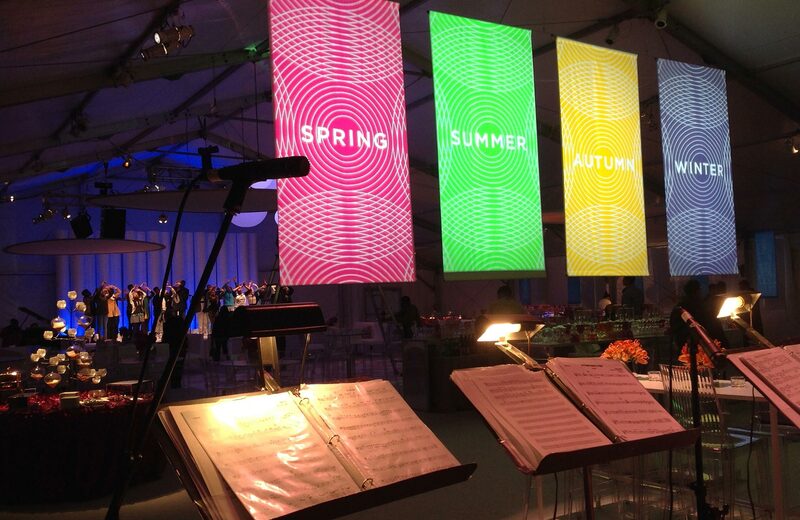 For corporate events, galas and mitzvahs, we tend to design with LEDs. These give us a look that can be more fun, vibrant and modern. We tend to use LEDs when clients want any color other than warm amber or a soft blush. As an example, check out this purple hue at the Library of Congress. Kudos to Design Cuisine for event styling. As our client experience showed us, LEDs are a wonderful addition to a lighting designer’s arsenal but sometimes there is no school like the old school. Tell us about your event and we’ll help you zero in on the best fit.